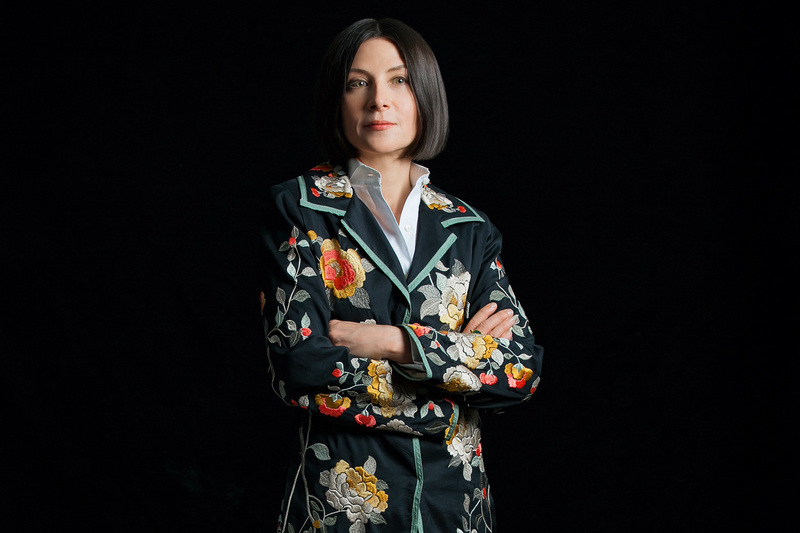 The author that continues to enchant and fascinate me in everything she does (yet, it is mostly the things I don’t see that are intriguing) is Donna Tartt. 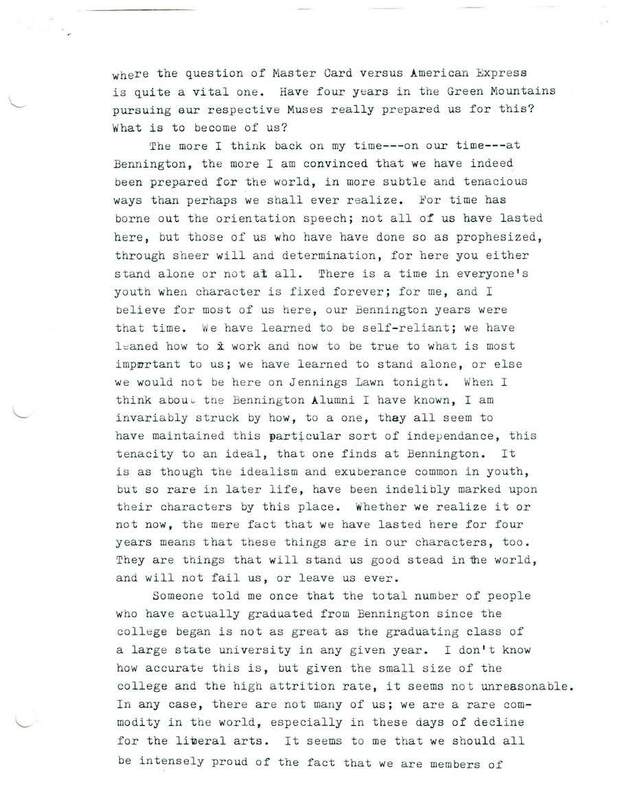 But Literary Bennington, the tumblr of Bennington College’s “literary mystique”, has unearthed Tartt’s graduation speech of 1986. Her typewritten words were spoken six years before the publication of her bacchanalian debut The Secret History, yet the address echoes the novel’s mystery, beauty, and terror. The campus as a sacred space is revealed when Tartt recalls her first interview: The first person who interviewed me when I was applying to school here had only been at Bennington for two years; a good deal of time had passed since then and many things of course had happened to her, but she told me that even so, that she loved this place as she did few other places in the world, and that her memories of Bennington had an intense power that had not lessened with time. The place was charged with significance for her as nowhere else; she told me then, years later, that she still dreamed of Bennington several times a year. She would be back here, in this place, standing on Commons Lawn or waling up to Jennings through the snow precisely as if she were eighteen years old again and the other years had never happened. And I remember being enchanted with the story: I wanted more than anything to go to school in such a charmed and numinous place, a place that had the overwhelming significance and potency of a dream. I think that what we will soon come to learn, as we go out into the world, that in all the best respects we will never leave Bennington at all. We have claimed this place as our own for a while; what we perhaps do not realize is that this place has claimed us, too, and claimed us very hard. In the most vital part of our memories, this lawn will always be the same impossible shade of green that it is this very night; Bennington will always be with us, no matter what. And as I recall my own university experiences, I feel that pull to the place that I stepped into when I was seventeen. I remember the hallowed halls and the rabbit warren leading to tiny lecture rooms. I remember the milky stone walls and tiled floor of the clock tower. 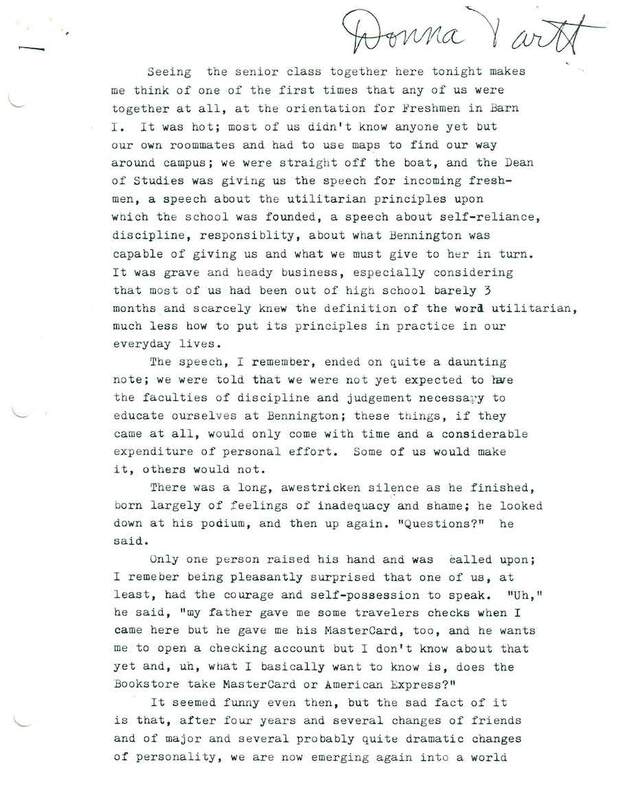 I know why Donna Tartt wanted to share that university experience, and I know why so many writers turn to the campus as the setting of their novels. University is a time of growth, mystery, curiosity, and ultimately – magic.